4HD is a free computer application that automatically adjusts the quality of online videos so that you are provided with the highest resolution available. The program does not create any browser add-ons or extensions, but runs as a separate service, 4hd.exe. The 4HD program is promoted at 4hd.com, but, if you do not remember downloading this program, the odds are that you have obtained it alongside other programs. 4HD is available free of charge; hence, the owners of the program provide you with third-party advertisements, which is one of the methods used to generate easy revenue. Due to the fact that the user is forced to put up with various pop-ups, web banners, and other advertisements, the program is categorized as adware, and we recommend that you remove 4HD from your computer as soon as possible . 4HD is not responsible for the advertisements displayed on the screen because they do not endorse the sponsors of the program. Any third-party website, including phishing websites, can be advertised by 4HD. As a result, you should ignore advertisements promoting online surveys, software, online games, and updates for different software programs, such as Java, Flash player, or Internet browsers. 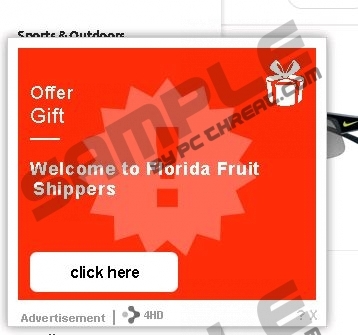 However, not all of the advertisements shown by the 4HD program are malicious; you may find pop-ups promoting well-known products and services. Similarly to many other advertising-supported programs, 4HD may be monitoring your online behavior. The developers of the program are interested in your search terms, browsing history, and browser settings so that they can make some changes in their product and, as a result, enhance your experience with the product. Moreover, information about your browsing behavior may be shared with third parties, who may also use the data obtained for multiple purposes. You can put an end to 4HD by removing it from your computer, so do not wait any longer. The instructions given below should help you remove 4HD from your computer, but, after uninstalling the program, you still need protection against malware and spyware. We suggest that you implement a reputable security program so that you can have 4HD removed and the system protected. The installation of 4HD will save your time in the future, because the system will be protected, and you will not need to manually check your operating system. In the pop-up window, click Add or Remove Programs. In order to make sure that the 4HD is no longer present on the PC, install our recommended scanner. Quick & tested solution for 4HD removal.